Australia is already at 19 per cent renewables as at June, and could reach 43 per cent renewables by 2030, just with the state targets in Queensland and Victoria, new data shows. Australia’s electricity grid reached a 19 per cent share of renewable energy in the year to June 30, and with a host of new wind and solar capacity to be added in the next two years will meet its 2030 target for emissions in the electricity sector nine years early. The latest analysis from The Australia Institute, in its regular energy market audit, is just the latest in a string of reports that highlight how ineffective the Coalition government’s emissions target are. The TAI suggests that the NEG will inspire just a 4 per cent cut in emissions between 2020 and 2030, but in effect this will all be met in the first year or two because of the wave of current investment. After that, the emissions component of the NEG will be all but useless, because it will already be met. That will make it a ready partner with the reliability obligation, because that will not be triggered – according to the Energy Security Board – because there is no impending reliability issue. As an argument of progress over business as usual, the NEG looks fairly hopeless. Indeed, many argue that it is worse than nothing because of the potential barriers erected by its sheer complexity, and possibly by the push within the Coalition to build one, and possibly three, new coal-fired generators. “On current policy settings, the 26% target will be achieved in 2021-22,” the report author Hugh Saddler says. Saddler, like so many others such as Green Energy Markets and Reputex, argues that the NEG could and “must” do much more. He notes that if Queensland meets its renewable energy target of 50 per cent by 2030, the country’s electricity sector emissions would have fallen 36 per cent by 2030. The problem is that the Coalition government’s failure to aim for a higher target – because of unrest in the Coalition ranks – passes up an opportunity for cheap abatement in electricity, thanks to the plunging cost of wind and solar, and imposes unneccessary and heavy costs on other industries. “In the absence of stronger emission reduction targets, the currently booming wind and solar generator construction industry is at risk of completely collapsing after 2021,” the report says. (Although RE would add that the corporate and state markets may take up some slack). The TAI data shows that in the year to June 2018, total renewable generation supplied 15.7 per cent of National Electricity Market generation, and of this variable renewable generators (wind and solar) supplied 7.6 per cent. The supply from the more than 7GW of rooftop solar on two million homes and businesses took the total renewable shoe of supply to 18.8 per cent. The TAI report notes that some 584MW wind and 624MW of large-scale solar have been added to the grid so far in 2018 (and some 700MW of rooftop solar), and more is expected to be commissioned by the end of 2018. “This surge in new capacity is the direct consequence of the renewable industry’s “escape” from two years of turmoil created in 2013 by the incoming Abbott government,” which led to the reduced …. renewable electricity generation target. In detail, the share of hydro was 8.0 per cent, well below the record level of 9.0% set in the year to December 2016, but the combined 7.6 per cent share of wind and solar generation was a record, as was the total generation of 14.2 TWh. The stream of new wind and solar projects has seen generation reach record levels, in terms of both total annual quantity and shares of grid generation, in each successive month for the past six months, a pattern which seems likely to continue for months into the future. Output from rooftop solar installations has also been growing steadily and in the last 12 months supplied 7.1 TWh, or 3.8 per cent of total supply. Saddler notes that the ACT, Victoria and Queensland governments to define their legislated or proposed renewable energy targets. The ACT ha a legislated target of 100 per cent renewable supply by 2020. A year ago, its share was just under 30 per cent, but TAI has not calculated its current level, other than to say it is likely to be considerably higher, given the addition of the Sapphire, Coonooer Bridge and Hornsdale wind farms. Victoria has legislated targets of 25 per cent by 2020 and 40 per cent by 2025 and as at June had an annual share of 18.3 per cent, although this could be higher with the inclusion of small renewable generators, such as landfill gas. Queensland has a (non-legislated) target of 50 per cent renewable electricity by 2030, but its share in the latest year was just 6.5 per cent – almost all of it rooftop solar – but this should jump in the current year as a large number of utility-scale solar and wind farms connect to the grid and reach full production. If all three targets are met, the TAI says, Australia will likely source 43 per cent of its electricity supply from renewables, including rooftop solar, by 2030 (see graph above). It means that the emissions obligation under the NEG on current targets would never be binding. Even if the Victoria Labor government lost power in the state election later this year, and the Coalition dumped the state target as they promise to do, this would still lead to minimal construction under the NEG. “Should … a new government cancel the VRET, the NEG may be called on to provide about 5 TWh of renewable electricity by 2030 to meet the target. “This would require about 2,000 MW of new wind and/or solar capacity, additional to that delivered by the LRET, over the ten years between 2020 and 2030. “To put this into context, the (Clean Energy Regulator’s) list of the wind and solar capacity which it expects to be commissioned over the next three years totals around 8,000 MW – that is, four times as much in less than one third of the time. Looks like someone picked the wrong filters for Figure 7. Rooftop solar includes the values for rooftop solar + hydro. To suggest that renewable generation capacity addition is only the result of supporting regulation and targets, as this article appears to, seems wrong, given that the recent rapid up-swing of projects has happened without any (federal) direction. Surely the technological and economic arguments are much stronger, and argue that capacity will continue to be built irrespective of government targets? When they are willing to take the market price yes you correct. Agreed! Technology and the market will always decide what happens. The planned closure of old coal fired power stations coupled with the competitive price of RE must surely provide a strong signal for more RE with or without an emissions target. Have we forgotten the “Kodak” experience?
! the IPA LNP wind federally and get up in Victoria and QLD. Total shout down as much as possible of any new grid build RE. Coal fired generators built and coal subsidized. 2 Labour gets up federally and in Vic and Qld. A push for more RE no coal gen built. Support for Grid scale solar and wind together with PHES. Which way will the voters move? Hi John, you ask about the voters. The ones that could be bothered to bone up on Climate policy and on Energy policy very well know the differences between the major parties. But there are plenty of punters that are clueless because they don’t do any research and they inevitably fall for the Loud spin jobs peddled by Rupert’s newsrags and the radio shock jocks. Looking at the fortnightly polls it is still roughly 50/50. The COAlition with its pre election ‘helicopter money’ will drag in the punters that look at their hip pocket first ahead of serious long term policy..
Joe I don’t think it’s ignorance – my conversations on these subjects with voters show most are aware of the central issues but believe the Murdoch rubbish rather than the science because they are made to feel that only Greenies and Chinese State underminers of Western Democracy believe in the SNAFU humans have created. I often use as a more neutral example that of plastic bags: I have dived sites that are very remote from human settlement, and there are points in the ocean 1000s of km away from cities, where we find a slush of plastic bags floating on the surface, we have whales and dolphins and turtles dying of ingesting them, yet in relative terms there’s less plastic bags going into the sea than carbon into the atmosphere by several orders of magnitude. There is no doubt of human agency! And just as one bug can kill you, human infestations will kill the earth. Perhaps humans do not deserve survival on this beautiful orb, but I hope they change course in time. Oh Hydrophilia, reaching the conclusion that humans are just sophisticated viruses is a point a only reach on a Friday night after a bottle of red and 3 single malts! Then I look at my kids and say f*#k you Rupert, I’m not lying down yet, because you walked out on your birthright and I’m still standing up for mine! Well, Mike, it’s past midnight on Friday, and I’m feeling totally pissed, not from red or single malt – although they have played a role – but I’ve been researching the rise of the Nazis in Germany, and I wonder what a minority of rational people thought about the descent into the adulation for Hitler by the masses who just wanted some relief from the endless grind of poverty. And that makes me very worried indeed. ‘Der Fuehrer’ was in the right place at the right time ( from his point of view ). WW1 and the misery left behind, then the hyperinflation period, the rise again of Nationalism, demonising minority groups and then a ‘messiah’ type figure emerges promising the better times that the people so desperately wanted. There are some similarities today with the past, America has delivered us / the world Donald J Trump. This won’t help. 14 characteristics of fascism. Many similarities to Oz and the US Conservative Governments. I stare in disbelief that the political party of “zero regulations” and red tape wants to max out the regulation and complexity meter with implementing a NEG! It’s sad that we have had ten years of policy uncertainty, but going by the graphs, it comes as pleasing relief that the renewable investment market responds well to removal of the bad policy brakes. In that case, it appears that market sentiment is still very strong, and that Australia is a desirable place to invest.Which only draws attention to these inept Australian attempts at introducing bad policy like the NEG … a hard boiled, malignant, diabolical attempt at providing Big Mal with a dubious energy policy legacy.It’ll be the energy allegory of changing the local vehicle design rules to legislate that all motorbikes be sold with a mandatory ash tray. Giles I think you are a pessimist. By my figures, there are 6.5 GW of committed wind to come on stream in the NEM before 2021. This does not include the monsters like Liverpool Range, Clarke Creek, Ceres, Southern Star and Golden Plains. All the new farms are long blade taller mast types. Using the target CF for Silverton of 44%, (i.e. less than Kiatta at 48%) that is 22-26 TWh. Assuming 1/3rd of the current rooftop solar boom results in reduced grid demand that’s another 2 and it seems there is about 6 GW of tracking solar moving through the system that is another 12-15 TWh plus another 2-3 from waste to energy, solar thermal, biomass heat recovery etc so a total of 39-45 TWh. In addition to the current 36 TWh on the NEG that is 73-85 TWh out of 190 or 38 – 45% renewables in the 21/22 financial year. Funny conversation the other day with a coal mine owner’s chief engineer: said he hates solar but realises it makes sense to cover his rehab areas with it! Is Ceres still a goer? SA has so much wind now and curtailment I can’t see the value until we get much more storage or the 2nd interconnector. Or learn how to to throttle NG plants. The NG plants can ramp fairly well. It is just AEMO concerned about system strength. (They say) I actually think it is about too many negative periods stuffing the “market”. Maybe a few more batteries will help with system strength. SA still has a LOT of old meters which need to be manually changed to boost during the day. “Power of choice” has hand balled meter upgrades/changes to the retailers and it is not going well. I’ve got a 30 day wait for a meter at a rental. I wonder if they realise how much it is costing them with the disc spinning backwards on a 6.6kWp system! On the 29/08/17, approval was granted for the Ceres Project’s Minor Amendment to the Development Approval. This Approval is comprised of 57 conditions. Rod. I am not sure any of these projects are goers, they all need significant expenditure on transmission and/or storage. Small plants spread along the existing 22-66 kV grid don’t need much of either. My point was that organic growth without monster plants will probably get us much further than anyone particularly the “Malcontent group” imagines. Hi Peter F, This one includes a submarine HVDC cable directly into an Adelaide substation, and the cable will be possible to transmit power in both directions (if the added connections are made at the the Yorke Peninsula end). From a security of supply point of view add this HVDC cable here is well worth while (provided electra net do not overpay for access). The farm is 600 MW and the two cables are 300 MW each. The farm is paying for the cable. Thanks Robert for the details. I was unaware of the security benefits for the Yorke peninsula but I suspect that a separate study would be conducted to see whether the DC cable is the best solution. My Problem with DC cables is that 1. They are both time consuming and expensive to fix when they go wrong, the very long downtime mitigates their security value. Basslink has been down at least six times in its life for almost 10 months in 12 years and has lost money. Cables in the US have also proved very time consuming to fix. Hi Peter F, The farm has done the study and they are paying for it. All Electric Net would need to do is add a connection locally on Yorke Peninsula and rent the capacity or allow Ceres to sell locally. At this time I would suspect they have done the numbers and there a profit for them. As for HVDC cables there are 2 cables so security is better than one, when they last did Cook Strait in NZ they put in 4 cables, and they run two as power and one as return. The forth cable is simply a spare. As you say it take a long time to get a cable ship to this end of the world. I agree with you in terms of locat supply, local storage covering local demand, but weather systems can be statewide so I suspect that we may still need more interconnects and maybe a better backbone (and one fly in the ointment is Japan and it’s stated intention to go H2), should we as a country do nothing about that idea, or do we build a system that could be quickly changed to take advantage of the opportunity. I personally have always liked the idea of putting Australian to work rather than exporting the jobs. I like PHES over batteries because there are more jobs for Australians (but they do different jobs in the network so we do need batteries). Europe and Biomass production will be different in Australia, even percentage wise. Our capacity is less and will always be less. Farms in Europe store animals in barns where as here we rarely house them. We do not have the same concentration of population, or food production (hence waste). In Europe lots of these systems are also CHP where in Australia we do not need the heat. My current thinking (and I offer a 100% guarantee that I am wrong) is that Bio will be 1% plus or – 0.5% maximum. As I read this article a very uncomfortable thought came to mind. It is clear we will exceed the 26% emissions target within two years set by the coalition government. The federal government remains adamant the 26% target must be enshrine in law using the NEG. We now have Tony Abbott publicly saying Australia should pull the pin on the Paris accord. Is this a ruse? I believe they want the NEG to get written into law and allow more new RE be installed for the next 18 months. As the percentage increases all manner of reports will be commissioned demonstrating the increase has lead to a drop in reliability (someone will write the report for enough money). Once the target is exceeded we will here calls by the likes of Pauline Hanson at the behests of the Monash group for a new coal fired power station be built to replace the next FF retirement because there is scope to stay above 26% emission reduction. They will have all the excuses under the sun (ark ark) as to why it is necessary using the reliability facet of the NEG. A new shiny FF power station (albeit a dull shade of black) may have a higher reliability then the current ageing clunkers. Scary stuff. I hope I am wrong. There is always that possibility but as Norske Hydro and Alcoa in Norway are now contracting wind with all the hydro they have available, I am pretty sure that someone like Windlab or Neoen could do a combined wind/solar/storage/demand response deal for Portland or Tomago at less cost than the charge for power from the new coaler. I just heard on the news Barnaby Joyce is supporting Tony Abbott’s position to vote down the NEG. We are in big trouble. Trouble? Why? The NEG is a terrible scheme, purpose-designed to hinder the growth of renewable energy. If dedicated enemies of renewable energy (Like Abbott and Joyce) vote down this awful scheme, good! They would have to be really, really stupid to vote it down – they will never see a scheme more suited to their interests – but then …. well … we all know that when God was handing out IQ points, Abbott and Joyce put their hands up to leave the room. I never thought I would agree with the Mad Monk on anything. But, I agree, we can do without the Neg in its current form. I totally agree the NEG is a terrible scheme but it has been designed as a tool to put RE on the back burner. Those who designed this horrid scheme will flog any thing they can to get their way. If Britain can do it for Benkley then what to stop Australian Pollies doing? It’s the Law that matters (not economics of it). What a bizarre conclusion. The reason we will meet the target in 2021 is because renewables are being installed at an ever increasing rate despite the policies of the coalition, they are being installed because they are commercially compelling, as the coal fleet ages further and becomes increasingly unreliable and expensive to maintain. The renewable industry really is its own worst enemy sometimes. Statements like these suggest that without government incentives no further installations will occur, nothing could be further from the truth, but it feeds into the right wing conspiracy theories perfectly. There are some positives despite all the political uncertainty. QLD has 4yr terms and the next election is more than three years away….so their 50% target is almost a given. Labor should prevail next year imo, and finally achieve some order out of the continuing chaos. Then we have the plethora of businesses turning to green energy to stay competitive, and more batteries, cheaper bills (? ), the ACT and NT initiatives, Snowy 2, if done properly, and other things I’m sure. It’s unstoppable remember. NB: Murphy was an optimist. Hi Steven Gannon, Be careful of Qld, it’s a stated target not a legislated target so they can move the goal posts, where as ACT is legislated target and so is Victoria. There is not enough said about the impact of load sharing, shifting and storage. If the eastern grid load was flat all day, the numbers are stunning. There are possibilities rarely discussed that would cut peak requirements by over 30%. We have to sit and think a bit more informed than the Monash team, but possibilities are going to emerge that will surprise most of us. Well called Doug – and prices are going to entice major shifts in demand. We haven’t begun to see the impact on the demand side as all the focus is on supply. This is not surprising as the daults like Abbott can’t imagine a world where we do better rather than bigger. I do hope that South Australia isn’t double counting Hornsdale in its renewables generation since it is contracted to ACT. You can be sure that the NEM aggregates by location, not by deemed supply (which likely doesn’t even take place, given the way in which power flows around the grid). Meanwhile – O ye of little faith! This site loves to tell us that wind and solar are becoming cheaper daily, and can undercut coal and other fuels. If that is so, then the best strategy is to ensure that existing aged coal plant carries on operating to the point where simple natural competition – not government edicts – ensures it is replaced with wind and solar and (large amounts of) storage, with no need for cheerleading. Perhaps there is a showstopper lurking somewhere? Why shouldn’t it be accounted by generation? Because ACT is claiming it. Thank you for not answering my question. Evidently Australia doesn’t produce any iron ore because China and Japan turn it into steel. Sure – let’s have another industrial revolution, send the kids back into the pits or the mills! Let’s drag the inevitable out for as long as possible so that the owners of aging, unreliable, dangerous even, assets can cream the last off it for as long as possible. It helps the few who have been “clever” enough to position themselves, so why should they lose out to the great unwashed? And as the coalers close and leave communities in their dust, let’s just accept that as the price of progress, winners and losers. The great Mandala of Life. The revolution will come if wind and solar prove to be superior technology. Otherwise, it will come if it is forced on the population and proves to be not quite what was promised. Wind and solar have already proven to be superior technologies. They are small(ish) and highly manufacturable techs – economies of scale, readily deployable tech to anywhere – as distinct from coal and nuclear stations which are honkous great Frankensteins of projects, and are each Frankensteins of cost to the taxpayer. Abbott and Christensen take note. If your claim is correct, then wind and solar will take over without any special provisions to help them, such as mandatory purchase of quantities of their output, and ditto for assorted green certificates in various countries. It would make this site redundant – there would be no need to cheerlead and berate measures that scale back their subsidies and privileged position. Yes they will – with their cost reduction curves and their dispatchable energy storage partnerships. Solar and wind, buddy. I think you have made a wrong bet on the coal/nuclear model i.e. the Neymar model of World Class football, who was a brilliant player / brilliant actor but in the end he can’t bring home the bacon. Hydro is the only storage that can manage baseload supply. There is no such thing as “dispatchable energy storage” without hydro, and there is no chance of Australia having enough hydro to run the country when the wind stops blowing. Installing internet controlled water heating and water pumping can reduce the minimum demand by 2-3 GW. Installing 5 kW/15 kWh batteries at 33% of small customers would also provide twice peak demand, so in practice grid controlled water heating and ice for cool rooms and batteries at every behind the meter solar installation combined with existing hydro would give you all the backup you need with no new pumped hydro. Hi Peter, I like your optimism! I do agree that smart grid technology offers efficiencies and opportunities, which may help to even out some of the peaks. I don’t agree that current technology solar PV and batteries provide enough energy density to make a step change in commercial applications, and the economics for large scale chemical storage for baseload won’t add up for a long time. Then it needs to be charged, at less than unity efficiency, so all batteries are a net load. I’d like to see more pumped hydro, but it seems the system doesn’t reward synchronous dispatchable power in the same way as variable non-synchronous power. a) most of them will reduce transmission losses by being either close to the load or generator so that I2R losses are minimised. In fact well sited batteries will offset all their internal losses due to saving in transmission losses. Pumped hydro like Snowy II and Battery of the Nation projects will add to transmission losses so net efficiency will be 55-65% vs 95-102% for batteries. EVs add load to the system, can’t see that helping, will probably force more investment in transmission and distribution. Charging managed to suit renewables availability… is this code for “retailers decide when your car gets charged”? Doesn’t sound very helpful to the customer. Battery efficiency vs transmission losses – batteries still have internal losses and will remain a net load. Choosing when to charge and discharge is an advantage and helpful, but still tough to charge when there is no wind and it’s already been in use. Batteries do have fast response, yes, but capacity is the challenge. Synchronous generators respond just fine. The 90-200s hydro response is to start from zero. Standard synchronous generators already online start responding to frequency immediately – it’s inherent in the generators rpm – except for the deadbands mentioned before. “Hydro is the only storage that can manage baseload supply.” For now. But have a look at the rate at which the price of battery storage is falling…….. 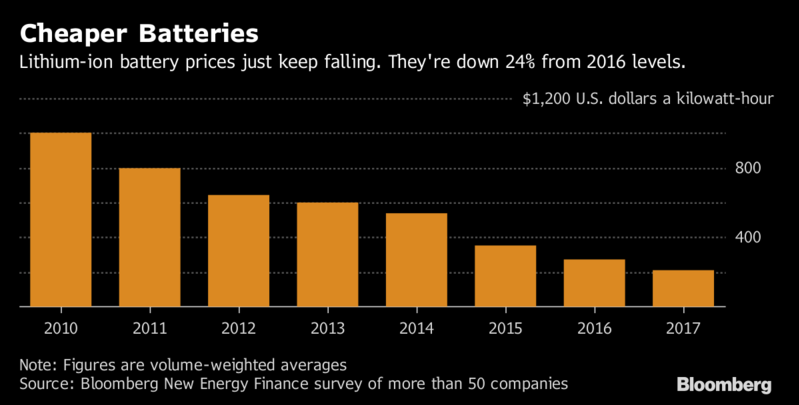 Going by the above trend – which will continue because of the dual global demands for both EVs and fixed storage – batteries are going to be dirt cheap 13 years from now**. Cheap enough for baseload storage. 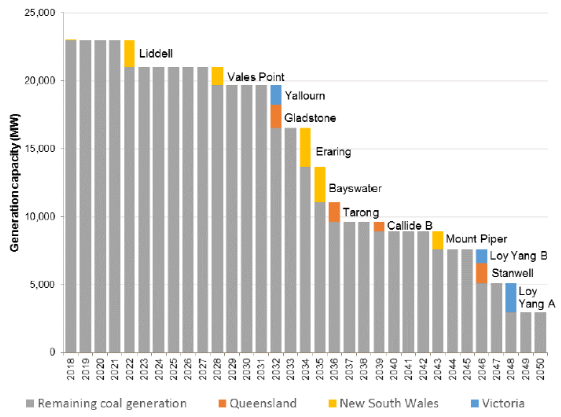 ** We have 13 years before coal generation starts to significantly drop away. Batteries as baseload: I reckon you should do this calc for yourself – what capacity battery would be needed to replace Northern Power Station for 24hrs. Then think about how that would be charged. 7,848,000kWh x $20 = $156 million to build a battery which can supply the same as Northern could have in a 24 hour period. Now try to justify the Nationals wanting to spend $5 billion of taxpayer dollars to build a couple of coal stations. I’m not sure about your 63% but ok, let’s run with it for 7,848 MWh. Are you building it now or in the future? I can’t agree that you can build something today in future money. So at $200/kWh, we are around $1.5bn for a single 24hr period. Now how do you charge it? Remember this is a stand-alone installation. So now you need to add the cost of another power geberator to charge it up. Let’s say 80% efficiency, so just to charge the 7848 MWh battery you need to deliver 9810 MWh into it, over some time period during which it is not able to deliver its full capacity. And while your charging system is devoted to charging the battery, you need another generator to supply the load. And then in 10-15yrs the battery is coming down it’s degradation curve and not able to deliver full capacity. In short, batteries are a net load, something has to charge them AND supply demand at the same time. Some engineers probably won’t get this, but a new coal or gas plant is a 50 year investment (with 10 of those years needed just to build the thing) so we need to look at the potential future competition using pricing trends extended out over that period to see if our new coal plant can recover the invested capital and turn a profit. We are building in the future with future money. So just three years after our new coal plant has started to generate power in 2028 following a ten year build (assuming work commences literally tomorrow) it already has some serious competition. Back to the battery. How do you charge it? A great engineer’s question, but the answer is I don’t care. I don’t care HOW it’s charged. I’m just buying power when it’s plentiful and cheap, and selling it when it’s scarce and expensive. That’s called the market, baby. In all probability the grid batteries will be paired with wind and/or solar farms. The round trip efficiencies to charge batteries are not important when the power is being purchased at a time or supplied from a source that is an order of magnitude cheaper than peak electricity pricing. I’m not even going to tell you how extremely cheap wind and solar energy will be by 2031 or you’ll be awake all night staring at the ceiling. In short, this is one of the many reasons why nobody will build another coal power plant in Australia. Firstly SA already has plenty of power reserves, they make the choice between importing coal or running their own gas purely on price. The storage they do have, has two basic functions, to supply/absorb power in case of a grid shock where they can add 100 MW as fast as 1,000 MW of spinning gas turbines could, the second is to store a little bit of excess wind and solar to reduce the run time of OC units and make the load profile on CC units smoother. Thus they won’t need to build backup storage for some years so today’s price is not relevant. Lets compromise on $80 a kWh by the time SA needs it. Over a 24 hour period solar + new wind turbines will never average less than 12% capacity factor so if we replaced Northern, (about 2 $bn) we could build say 550 MW of wind $900 m, 500 MW of solar $600 m and 6,000 MWh of batteries. Battery systems are running at 90% round trip so we can deliver 2,900 MWh from the generators and 5,400 from the battery more than enough to cover the 24 hour loss of Northern, same capital costs and a quarter of the running costs. When you refer to capacity factor, do you mean capacity not used, or capacity that is available? When I use the term availability for wind and solar, I mean capacity that is available due to, say, lack of fuel. But capacity factor when applied to a coal power station means capacity not used, even if it available. This reduced capacity factor is then at the mercy of decision making, not at the whim of the weather. Hi itdoesntaddup, Please provide proof of your claims that Australia has any of the following special provision to help them take over! mandatory purchase of quantities of output? Tell you what, I might just give you a hand! In reality what happen was retailer bundled the purchase of the electricity with the purchase of the LGC in long term supply contracts. So current wholesale price is about $90 per MWhr and as a retailer they offered contracts at $55.00 including LGC (Stockyard Hill Wind Farm price). As a retailer you are required to hand in so many LGC and you are free to also on sell the LGC on the open market above your requirements (including the idea that you can pay the penalty and then reclaim it if you think (they already know) that the price of LGC will drop to $0.00 from the current price of about $80. So the customer pays for the green energy. So in KISS terms the retailer if they refuse to buy LGC can wait 3 years to buy the LGC at a price of $0.00 and claim the penalty back (one retailer has stated they will make money doing that on it not one or two dollars, it’s millions). So in simple KISS terms a jurno has written that Wind and Solar have all received the $80 for each and every one of the LGC created. That statement is then quoted by IDIOTS as proof that RE is both subsided and too expensive. Hi Ren Stimpy, and we as in Australians can also manufacture many of the parts of the systems (we do not have to buy everything offshore). Keep jobs in Australia is much better that exporting all the work we can. Perhaps you could estimate when China will meet its own emission standards, rather than fudging them like VW. Hi itdoesntadup, go and dip you toe in the water of the GBR and then claim Australia contribution to raising the temperature of the sea is 0.0000. That claim is as good as the claim the CC is a furphy because the Temperature if the top 2000m of the sea has risen since 1955 by a whopping 0.114C and the next 3000m has risen by 0.000C. All perfectly good strawman arguments, accurate and concise (and incredibly selective) just to prove a point. Forget about the atmosphere where most of the heat and most of the CO2 are released, forget about ice, and the physics that tells me the you live in an economy and not in an environment (I wrote this on the board to some year 13 students about the NOT rules for camp, “We burn everything!” Even they understood you can breath money and you can do not need an environment to live in. Hi itdoesntaddup, Like Ben you fail again. Generators get paid twice, once to make the electricity and then they get paid for the LGC they create. That the way the Australian Gov wrote the legislation and (Strawman again) 100% correct. However if you as a retailer bundle your price to include the LGC as you buy the electricity where is the LGC money (as a generator you have just handed them over for nothing). What both you and Ben fail to realise is that as a retailer you now have a bunch of LGC and you are free to sell them on the open market (Retailer are the people required to surrender the LGC) and if you paid say $55,00 per MWhr the LGC has a price of say about $80, whom is making a killing on the market place. So how did ACT contract their electricity, contract price plus LGC, but it does add up, they get the electricity plus they get the LGC (they could be making a killing) but they chose to receive the LGC as part of the contract and they also chose to surrender the LGC. The contract price is below the average wholesale price to protect ACT residents from price rises. Hi All, Today on the ABC “Landline” program there is a story called “Black Gold”. The story is not about RE per say but it is there in the background. Many people would have no idea how long this story has been going on. In terms of mass production it started in Israel in 1949 very shortly after they became independent state. In 1962 some medico did a report on Israel using the medical records of 200,000 people on virus or bacterial (excluding any war type injuries, car or bike or falls) sickness. They reported an increase in infections of 0.003%, but one of the medico wrote a dissenting opinion, based on the idea that there had been an increase in the population study group of about 10% (mostly from overseas, and not always in the best of health when they arrived) and that alone was enough for him to say that the figure of 0.003% needed to be reduced. In 1955 LA in the USA started with primary treatment and they had 24 engines at 1500 Hp making electricity. In 1995 LA added secondary treatment to all plants. In 2011 as part of a project I was trying to get going I found Sydney Water Corporation had added 5 plants with primary treatment. Aerobic sewage plants use an average (about) 1 kWhr to treat sewage per person per day (pumping ,stirring and oxygenation and they can stink). Anaerobic sewage plants produce about (about) 0.0004 kWhr to treat sewage per person per day (There is no smell with this, and if you can smell odour your are in danger). Reed beds remove the salts humans produce (Phosphate and Potassium), and you need to harvest the reeds to make space for more growth. Reeds make good mulch (dried in hot sunlight). Sunlight (or Ultraviolet light globes commonly called Black Lights) destroys the ability of pathogens to reproduce (Sydney Water Corporation use 40 days process, and most Pathogens can not survive that long without oxygen 99.9% however if you do 90 days it goes to 100%). The fertilizer produced is natural and the best on market (they did give some time frames on usages and their rules and regulation requirements). The addition of waste food increase power output, example 1 ton of human waste is about 40 kWhr, but 1 ton of old Pizza boxes is about 480 kWhr (it measured in dry solids. Vegetable oils and animal fats are a lot higher production than green leaves or grasses about 80 kWhr to 120 kWhr). All biological materials (except wood) can be used, but given that the reed are high in Phosphate and Potassium, they are better used as mulch. The article uses the words, “no impending reliability issue” in the same sentence as, “Energy Security Board”. In fact, the Dec17 Health of the National Electricity Market describes the “health of the current reliability of supply in the NEM is critical”. And it describes this reliability issue as a combination of retirement of coal generation and renewable penetration. Ben, the problem is that most people see the future as a linear projection from the past. The only state that has any significant generation security problem is NSW. Queensland, Tasmania and soon SA have spare power capacity running out their ears and they are all building more. Victoria got through last summer without running its emergency diesels. By next summer it will have about 700 MW of new solar, 300 MW of new wind and 200 MW of new batteries so again its security is improving, plus SA will be importing less as its large solar, upgraded Torrens Island and new high CF wind come on stream. So power security is improving faster than anyone dared to imagine. Hi Peter, I agree there is more capacity being built, but this in the form of wind and solar. Implicit in your analysis is the assumption that more renewable capacity equates to more available generation. But this is only partly true, about 35% true to be more accurate. To paraphrase an old analogy, you can bring a wind farm to the grid, but you can’t make it generate! And there will still be long periods where there is no wind? And we keep installing taller towers every 20yrs? Hardly any of the currently proposed PV arrays are tracking. I suppose we could always turn up Europe and the US examples, where renewable installations have resulted in increased gas power generation. Even now according to anero.id there are are never any periods where there is no wind and the majority of the wind turbines are older designs. Even the newer ones like Conooer Bridge commissioned in 2016 which is averaging about 45% capacity factor are already superseded. The current version of the same wind turbines is expected to produce 10% more power per year. NREL says 60-65% capacity factors will become common after 2021-22. Last week there was a period of almost three days where SA wind output was around 1% of installed capacity. It wasn’t much better in NSW, VIC or TAS. SA has1800 MW wind installed for around 1500 MW of demand. The installed wind capacity is set to double. The quantity of AEMO lack of reserve notices is increasing. Link to the UK stats for power generation. Note the increase in gas, yes it’s because wind and solar are displacing coal, but not one-for-one. How long do you think that gas turbines will need to be around to fill in the gaps? How much will they need to charge to recoup operation and maintenance costs? What will politicians do when the lights go out the first time, and it’s just because of the wind? Last week? wind provided more than 60% of supply in south australia throughout the whole week. Almost all proposed PV has tracking. 90%. NSW has over 50 proposed PV projects. 13 of them are nominated to include tracking. I didn’t bother checking the other states. Every single solar farm bigger than 10MW connected this year in NSW has tracking. Every single solar farm in NSW under construction has tracking. The others in the pipeline probably event got close enough to financial close to make an announcement yet. You really do just make stuff up don’t you. What are the projects you are referring to? Griffith, Parkes, Manildra, Dubbo, Beryl, Coleambally. In Queensland, Sun Metals (124MW), Clare (100MW), ROSS RIVER (100MW), WHITSUNDAY, DAYDREAM, HAMILTON, Kidston, oakey 1, oakey 2, Longreach, Hughenden, the list goes on. ALL TRACKNG. In South australia, the only big solar farm there, Bungala, is tracking, in Victoria, the only big solar farm there, Ganawaara, is tracking. The new ones, Karadoc and Numurkah, are tracking. In WA the first solar farm to be built since 2012, emu downs, is tracking. Why don’t you cite a few 10MW + projects that don’t? Hi Giles, thanks for the info, happy to be wrong on that, tracking is a better option. Perhaps you could ask AEMO to update their data? The AEMO spreadsheets don’t identify all those sites as having tracking eg Parkes, Manildra, Griffith are only listed as “PV Panels”. Ben I think you cop a fair bit of flack with your rather narrow comments about wind and how little is being produced on occasion, which are similar to comments from various ideological objectors of AGW. I don’t think there would be many on this site who see some silver bullet to the current power woes in Australia, other than the equivocating LNP growing a pair: wind is an important part of the mix. Jurisdictions like Tas, Norway and some states of Canada, wind is a great adjunct to conventional hydro. Its variability means it, IMO, with largely be a low cost way of “stretching” dispatchable power, especially until the demand side catches up with the benefits of time of use scheduling. Solar OTOH is much more predictable and fits well with diurnal cycle PHES. Batteries fit well with BTM solar since many, perhaps most, households have low demand during the periods of maximum solar. Commercial loads have an ideal chance to use thermal storage to minimise their demand outside solar periods. Models or conceptualisations that assume static load patterns based on today’s profiles miss the point, that ubiquitous solar is going to result in extremely low cost power during the day, and demand inevitably will shift to suit. Hi Mike, I think I cop flak because certain regular commentors here share an anti-social tribal mentality and prefer to play the man instead of the ball. I don’t think it’s ideological to refer to wind power as intermittent and to provide examples of that fundamental fact. This site is very anti-LNP, but this is mostly jumping on the bandwagon, and even this site says in one article “bad government” but says in the next article “record renewable investment”. That is plainly partisan political activity (or lobbying, or activism or whatever) and not an example of unbiased reporting, and I think it is fine to question it when it happens. If doing that sends ripples through the groupthink then so be it. Many people on this site find it impossible to separate criticism of policy from criticism of technology and cannot differentiate a question on the above from climate change denial. I believe the above summary is indicative of the broader community’s abilities to engage in debate, regardless of the topic under discussion and regardless of an individual’s perspective! So, you might call it flak, but unfortunately I think it is merely standard fare. You might see similar if you frequented a “pro-coal” forum to argue against coal subsidies. Ben – in my mind it crosses over to ideological if repeated reference is made to the level of wind output, as if it were an important or decisive factor, when clearly it is not. Investors in wind make their decisions eyes open around that fact, purchases of wind PPAs likewise. Having wind available is a significant benefit and its disbenefits well understood and compensated for. It’s also probably quite appropriate to be “anti-LNP” on a site like this, since the LNP has come out with policies that fly in the face of reason or economics, and are not even beneficial to their constituents. The one virtue of the Nationals is that they have been consistently wrong, while the Liberals have flipped flopped all over the place! I agree that many social media sites have a poor record – I withdrew several years ago from FB for that reason. I also believe people should use their real names and be a bit less closeted about their identity if they wish to be taken serious – having to stand up for what you believe in tends to make you a bit more circumspect about talking rubbish or merely denigrating others. I am a contributor on a mining site so know how partisan such sites can become! But bottom line is, in my conversations with a wide range of people, including on street stalls, is that energy and the transition to decarbonise it has become very partisan, to the detriment of minimising the negative impacts of that on many people and our economy. And that is definitely something to call out! Hi Peter F, It seems my friendly STRAWMAN has moved on. Pick a sentence about generation and then ignore your statement just to try and prove he right and your wrong. He specialises in asking a question having taken the meaning out of context. To me this is a good example of a lawyers trick, take a sentence apart to prove that the whole article is wrong. I blocked him because of his persistence in doing just that. Take the sentence “Look Out” yelled at someone with their head out of the window he will set out to prove that someone was out to murder someone because they were told to just look out the window and the next pole would have take their head off.